This blog is dedicated to anything and everything about Anfield. Football is actually a beautiful game. It is about passing and receiving among one’s own teammates and putting the ball into the net in the right direction. Anfield, the home of Liverpool FC and one of the most historic sports stadiums not just in England, but around the world. A stadium that has been home to some of the greatest players and managers in English football, witnessed its side conquer Europe and lift 18 League titles and earned praise from visiting managers and players for it’s unique atmosphere. Think of Anfield and you immediately picture the iconic images of The Kop, acclaimed for its atmosphere, culture and traditions. The Kop found fame during a boom era for the city of Liverpool in the ’60s; the swaying masses singing to the tunes of the Beatles as Bill Shankly transformed the team on the pitch to become the dominant force in English football. The Spion Kop, as it was known prior to all-seater stadia coming into effect, was built in 1906 and expanded in the 1920s to accommodate a staggering 27,000 supporters. As Shankly’s side swept all before them, The Kop became renowned for it’s spontaneous singing and unique sense of humour. The final day of the standing Kop took place in May 1994, as Jeremy Goss scored the only goal of the game for Norwich. The all-seater Kop remains an impressive sight, holding 13,000 supporters and remaining the biggest single-tier structure in Britain. Many of the traditions that were introduced during that halcyon era of the ’60s and ’70s remain today. The Kop crowd always clap the opposing team’s goalkeeper as he approaches them; most keepers are aware of this and acknowledge the show of respect. Walk around Anfield and you’ll find The Shankly Gates, The Paisley Gates and The Hillsborough Memorial. Heritage at every turn. Of course, the biggest tradition of all is the signing of “You’ll Never Walk Alone” before the match and as the game comes to it’s conclusion. Think of Anfield and it’s easy to recall the numerous famous European nights. From super-sub David Fairclough’s goal against St. Etienne in 1977 to Luis Garcia’s goal against Chelsea in 2005, Anfield has witnessed some incredible moments and with it some inspiring atmospheres. Gerard Houllier’s return from heart surgery against Roma in 2001, Steven Gerrard’s last-gasp Olympiakos winner, the 4-0 thrashing of Real Madrid, Gary McAllister’s penalty against Barcelona—the list is long and glorious. Read the following quotes, then guess which footballer said it and which match he is referring to. “I have never heard anything like it before and I don’t think I ever will again. It is the best atmosphere I’ve ever played in. “I walked out into that cauldron and heard that singing and saw that passion. The hairs on my arms were standing up. To see a spectacle like that is inspiring to anyone. “I just kept looking around, trying to take it all in. I wasn’t daunted by it, but it was amazing. I wish more crowds were like that. You probably guessed, correctly, that it was the 2005 Champions League semi-final against Chelsea that was being described. But those are the words of the opposing captain, John Terry, in his autobiography. Terry’s words wouldn’t come as a surprise to anybody that was there that evening. A cauldron of noise is often used to describe football crowds but this really was—well, perhaps except the moment Eidur Gudjohnsen’s shot flashed across the Kop goal and the ground held it’s breath. Terry isn’t the only player to have confessed his admiration for the Anfield crowd. Here’s Thierry Henry describing his thoughts. Of course, those are just two relatively recent examples of visiting players being in awe of the Anfield crowd, but any professional footballer would be privileged to play at Anfield, especially on a European night. Liverpool and Anfield has experienced ecstasy, but also agony. Michael Thomas’ last minute goal in the League title decider with Arsenal broke Liverpudlian hearts in 1990. In the immediate aftermath of Hillsborough, the Kop and Anfield pitch were covered in flowers as mourners paid their respects to the 96. 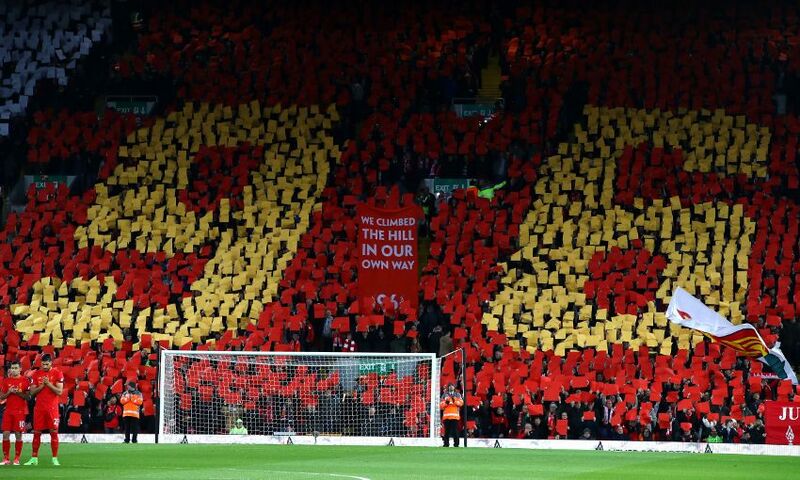 In the 24 years since the Hillsborough disaster, the annual memorial service has taken place each year on The Kop. Culminating in over 30,000 people attending the 20th anniversary in 2009, which ultimately resulted in The Truth finally being told, with Prime Minister David Cameron’s Parliamentary apology in 2012. Plans are now in place for Liverpool to remain at Anfield by expanding the Main Stand and Anfield Road End. The club’s principal owner, John W. Henry, rightly recognises that Anfield is unrivalled.